The Western Yar valley, from source to mouth of the Western Yar, with the tributary of the Thorley Brook and the coastal strip to the west as far as Fort Albert. 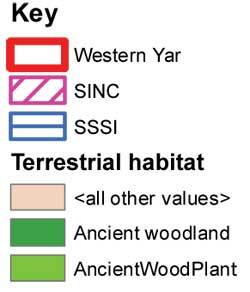 IW Joint Character Area: harbours and creeks, intensive agriculture, landscape improvement zone, northern coastal cliffs. A wide shallow valley with estuarine habitats, including saltmarsh, mudflats, reedbeds. Arable fields. The northern cliffs are wooded. Hamstead beds, Bembridge Limestone, Bembridge Marls. Alluvium, river terraces and tidal flat deposits. The Western Yar flows south –north, and it is tidal from Freshwater Causeway. The Thorley Brook flows east - west to join the estuary 200m south of the mouth of the river. A creek to the west of the main channel has a small sand dune system. The slumping low clay cliffs further to the west have secondary woodland. Starlet sea anemone; Adder; Water vole; Divided sedge; Reed bunting; Brown Hare; Black-tailed godwit (wintering); Curlew (wintering); Borrer’s saltmarsh grass; Red squirrel; Dormouse; Lapwing (wintering); Desmoulin’s whorl-snail. There is a footpath along the eastern side of the Western Yar. From Freshwater Causeway it becomes a cycleway. 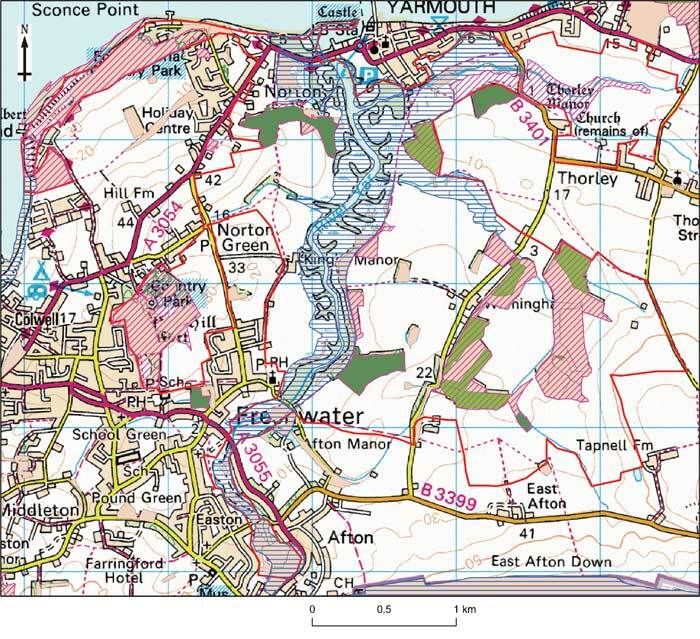 There is a circular walk around the estuary from Yarmouth. Fort Victoria has been designated as a country park.